Home » Posts Tagged "geo theme"
This is the basic rules for all importing into databases with text.csv files not just Geo Theme. So we understand we use Open Office right! Available for both Windows and Mac No questions asked good. So you have you spread sheet of data you have created or exported. If you have not then I suggest that you create one by going to GT Tools >> Import/Export and downloading one or grabbing it from here. If this does not work for any reason check out FAQ’s at the end. I get asked quite a lot what are the setting meant to be when opening a comma separated value file, so I thought I would just add in a screenshot to help of the opening screen. Select UTF8 for the Character set, Seperated by Comma (Hense CSV) Text Delimiter ” (this is default) and Quoted Field as text. That is ready to open. You can click on the image to the right to open a larger version. The most important aspect of importing into a database is saving correctly. Okay its not save it is file Save as! 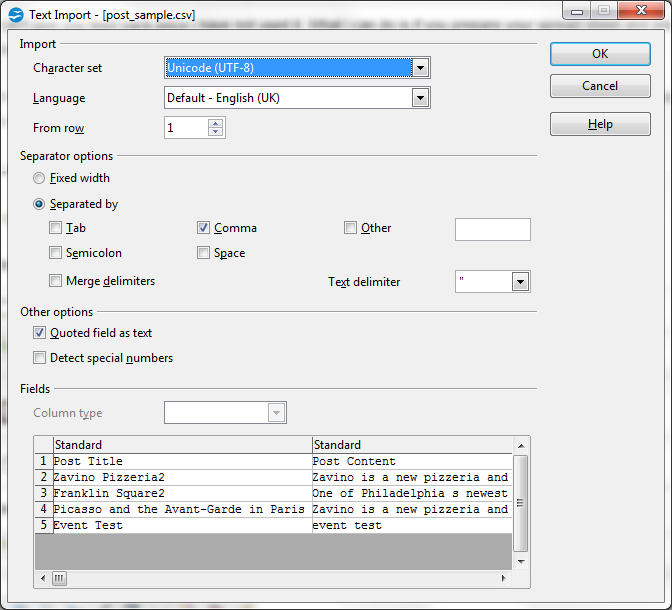 Next the Dialog box, two things here Save as type will be text.csv and you have to tick the Edit Filter Settings Box. Next click Keep Current Format. Next is the below dialog box it is important to change the Character set to Unicode (UTF8) just press the U on your key board and down twice for a quick way to select it from the list. 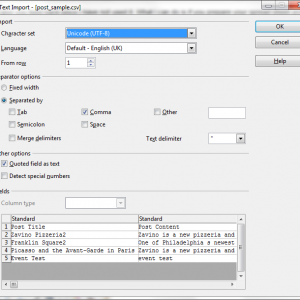 You also want to make sure the you tick the Quote all text cells, this is important as the format we are saving is CSV Comma Separated Values, when importing with comma separated items like category1,catergory2 within a cell what we are doing is wrapping them ,”category1,catergory2″, so the data stays in that column. That is all you need to know, just a little FAQ below in case you have issues. Well that is annoying, So all you need to do is highlight the column by clicking on the column letter identifier so it goes blue, then Go to the menu, Format >> Change Case >> lowercase. Since Version 3.4.1 It has been a requirement that you need either 1 or 0 in the is_featured column, 1 for yes and 0 for no. You can fix this using GT Tools >> Diagnostics >> Run and there is a under “Featured database checks” click the fix button. Any more bits you want me to add to the FAQ or Tutorial let me know. GeoTheme is a WordPress based “Yelp Clone” directory theme. Well believe me I had a struggle with this one, I was asked by a client to find a directory based website template, they wanted to create a directory based on places and events in London, already being familiar with WordPress I took the logical route of looking at plugins and themes that could be used as a starting point. After many hours of deliberation and reading reviews on geo location based products I decided to recommend GeoTheme as the starting point for the project. A few weeks later I had delivered with the support of GeoTheme and its members in creating this site, and it has worked out very well. There were some hurdles to overcome mainly due to Geotheme’s vast array of options and setup complexity’s and the particular requirements of my client, but what was achieved was an end result that worked and looked great. I was then approached by one of the guy’s who developed GeoTheme to assist them as a moderator on their support forum, I was pleased to join such a great team of very good developers to assist them in support queries. This left me with a bit of a dilemma as a moderator I had to know more about this complex theme fast, so I used one of my dormant domains to create a site to be able to cross reference with when answering questions on the forum, so I quickly put together The Bathroom Directory, pretty much within a few days of the launch I had paid listings. I did not go out to create a business which proves how well GeoTheme works. This site is now ran by Ben Clark my nephew, he came up to London to stay with me and loved the concept behind the site and it’s design, so it is now being run as a business, and he is doing rather well with it, now he has well over a thousand listing many paid for and is quickly moving towards having a successful business. I now have had to set up another Geotheme site on my development server as a test site for my work on the forum. If you would like to know more about Geotheme then please feel free to contact me. You can also find more details on the Geo Theme website here. Ben and Tim Clark are a dynamic duo who love nothing better than creating..
Tim is Based in London and has been implementing web sites for many years, working with WordPress and Magento and before that old fashioned HTML. Ben is studying and learning fast often being thrown in the deep end by Uncle Tim, but copes with ease.